Frequently asking for directives to be repeated, delays in response time, difficulty following complex auditory directives, decreased comprehension in noise (the list goes on). 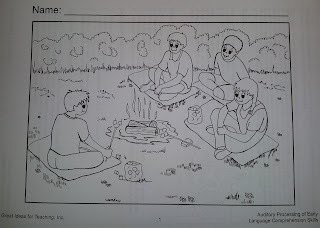 According to ASHA's technical report (2005), "(C)APD (central auditory processing disorders) may lead to or be associated with difficulties in higher order language, learning, and communication functions." Auditory Processing of Early Language Comprehension Skills is a useful resource from Great Ideas for Teaching Inc. meant to target the deficits those with processing disorders present. 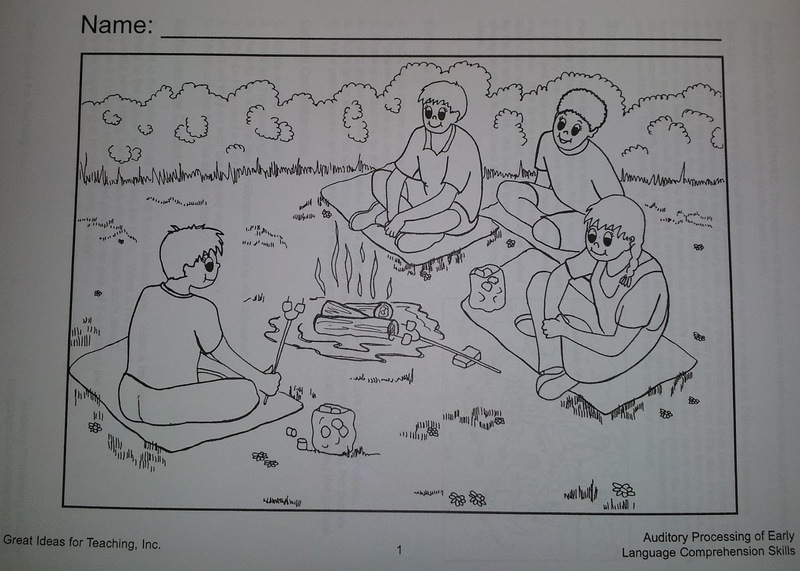 This 60 page workbook contains 30 reproducible black and white illustrations designed to improve comprehension skills. While looking at pictures, students listen to a story pertaining to the illustration. 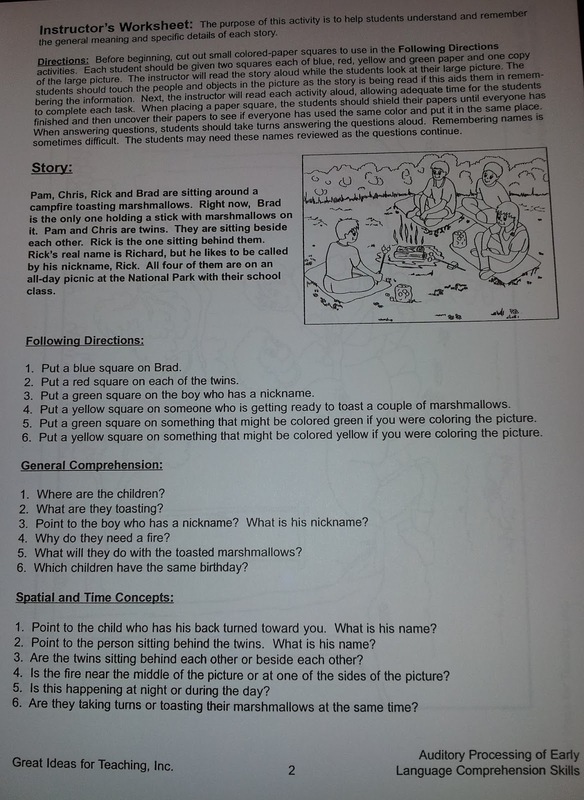 Questions that gauge students' abilities related to comprehension, execution of directives, use of context clues, memory, inferencing, time, spatial details, etc. are provided (see below). Despite being advertised as an activity for younger ages (6-9), students of any age who lack the aforementioned skills can benefit from these lessons. Activities can easily be expanded upon by requiring students to provide written instead of oral responses, as well as prompting students to provide supporting details to rationalize their responses. The activities in Auditory Processing of Early Language Comprehension Skills are straightforward, yet target a multitude of skills. 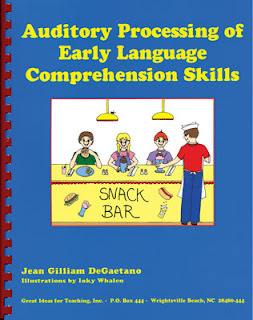 For those with skills that are a bit more advanced, Targeting Auditory Memory and Processing is a workbook from the same author that addresses auditory memory in addition to vocabulary, prepositions, verbs, etc. American Speech-Language-Hearing Association. (2005). (central) auditory processing disorders [Technical Report]. Available from www.asha.org/policy. 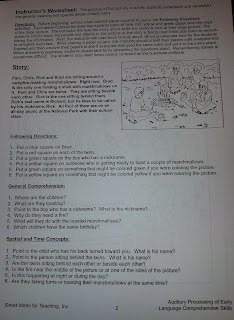 Disclosure Statement: Great Ideas for Teaching, Inc. provided resources for testing in exchange for a review. The opinions expressed in this review are mine. No other compensation was provided.